Operation Neptune was the code name for the airborne and glider assault during the D Day invasion. The mission of the XVIII Airborne Corps, was to conduct parachute and glider landing operations to establish an airhead with defensive blocking positions in Normandy to support the amphibious assault invasion. The XVIII Airborne Corps was comprised of the combat jump tested 82nd Airborne Division and the untested 101st Airborne Division (it was their first combat jump). There were more than 13,000 soldiers who took part in this historic airborne operation. The paratroopers took off before midnight on 5 June 1944 and jumped into France about an hour and a half later. The jump phase lasted about 3 hours before most of the paratroopers were inserted. Each of the smaller units had specific objectives in support of their mission to occupy defensive positions to block German counter attacks that might threaten the Utah beach amphibious assault during the D Day invasion. In the American sector, the 82nd Airborne Division parachute assault (Operation Boston) and the 101st Airborne Division (Operation Albany) and the glider operations achieved most of their objectives, despite considerable confusion, weather problems, enemy anti-aircraft fire and small arms fire, wrong drop zones, and a lot of destroyed equipment, especially for the gliders. There were also some fierce battles on the ground. As always in the fog of war, it never quite went to the plan, but the American leaders overcame many obstacles, and despite being behind scheduled times, achieved enough success to accomplish the overall mission. The code name for the initial glider phase of assault for the 82nd was (Detroit) and for the 101st was (Chicago). The initial assault landings went fairly well, and provide some anti-tank weapons and artillery to the soldiers on the ground, but operations after the initial 0400 assaults, suffered more lost equipment and men during the next 2 days. There were 517 gliders used in the assault. 222 were Hora gliders; 295 were Waco gliders. All the Hora gliders were destroyed beyond repair during the landings, either as a result of enemy fire or rough landings. Most of the 295 Waco gliders survived and could have been used again, but 97% were abandoned in the landing zones, as repair teams were not available to repair them. Here are some figures of the human cost of these operations. D-Day casualties for the airborne divisions were calculated in August 1944 as 1,240 for the 101st Airborne Division and 1,259 for the 82nd Airborne. Here is a breakdown of these figures for the 101st Airborne Division--they suffered 182 killed, 557 wounded, and 501 missing. For the 82nd Airborne Division, the total was 156 killed, 347 wounded, and 756 missing (the source of these figures are from US Army Military History records). As an interesting side note, each paratrooper had to complete 3 successful jumps to be qualified for the assault. However, most of these jumps were in daylight and this was a night operation—a whole lot different situation to those of us parachute qualified in the military. Add enemy firing at you and you are dangling in the air without much of a chance to defend yourself, it takes brave souls who faced death and did their job regardless of their fear and the obstacles they faced. Ste. 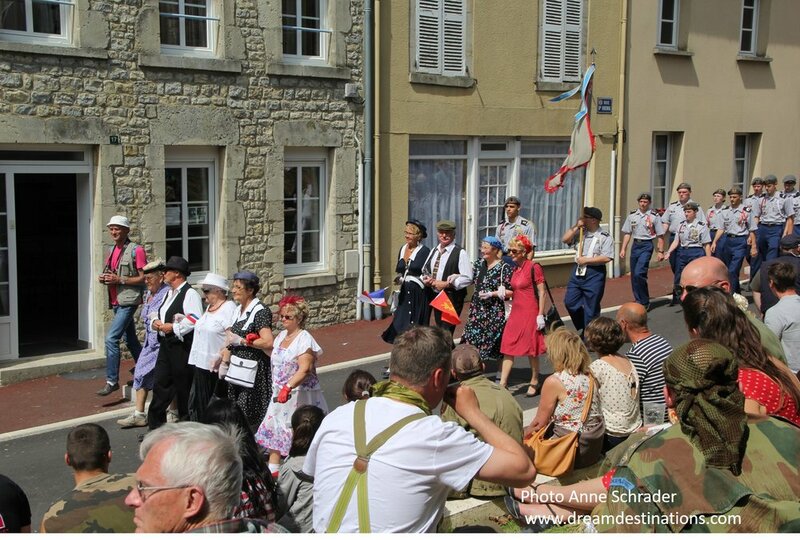 Mere Eglise is the first French town liberated during Operation Overlord, the D Day invasion. By 0430 on the morning of the invasion, the American Flag was flying over the village. Fighting continued until 7 June, when tanks arrived to relieve the paratroopers. The fighting around the village was fierce. The battle lasted over 2 hours and there were significant losses by the American Forces, but finally the 505th Parachute Regiment, led by LTC Edward Krause, took the village. This battle is probably best known for the excellent story as part of the movie, The Longest Day. And the most famous participant was then PFC John Steele, whose parachute got caught on the tower of the church and he dangled helplessly during the battle as he pretended to play dead. This vivid image was not lost on the village, and today a replica hangs on the church tower, even though it is not the correct spire that he got entangled with, although it really does not matter—it is easy to imagine the horror being trapped like that during a battle. This awesome museum is dedicated to the airborne soldiers of the 82nd and the 101st Airborne Divisions. These paratroopers were a key part of the D Day invasion. Their story is told here—the night of 5 June and 6 June fighting from these forces is legendary. 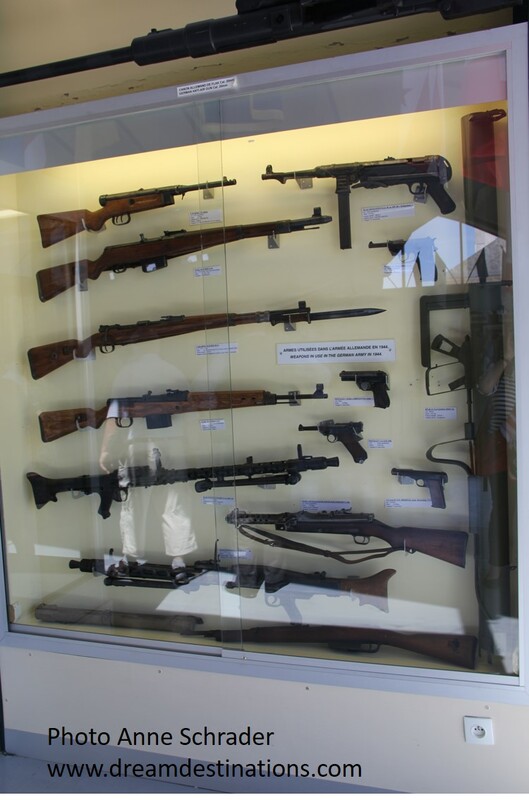 The museum was dedicated on the 20th Anniversary of the D Day Invasion in 1964. At that time there was only one building, the WACO building. Now, there are 3 museum buildings, a conference center and a gift shop. The WACO building is dedicated to the gliders used in the D Day air assault of Normandy. Over 500 were used in the invasion to carry men, vehicles, heavy weapons and ammunition and suppliers during the invasion. There is an actual WACO glider in the museum complete with 12 soldiers loaded in the glider ready for battle. This was the method for about 4,400 men used to go to war in France—when you see how fragile these gliders are in person, it is amazing how brave they were to even try—many died or were wounded during the assault landings. This is my favorite building of the museum. The C-47 Building houses an actual plane ready to take off from England with its load of paratroopers. There are excellent displays of the equipment used during this famous combat drop. The Neptune Operation building was opened just in time for the 70th Anniversary of D Day and we were among the first to see it from the tour we led in 2014. This is a dramatic display of what it is like to make a night parachute jump from a C-47 and the battles that happened after the combat jump. For military history buffs, there can be no better place to be than Ste. Mere Eglise on 6 June, in my humble opinion. The town square is alive with veterans, reenactors dressed up in amazing reproductions of uniforms and dresses of 1944, a lot of patriotic festival goers—it is a celebration of what liberty really looks to those who once were occupied by German Forces. The villagers have never forgot the price paid in lives for their freedom. There is a parade during this festival day, but it is not really a well-organized, formal parade—it more is fun groups honoring the sacrifice made during the D Day invasion—bands, veterans and service organizations like the Elks, reenactors with their vehicles, and French dignitaries and festival organizers. The highlight and the real heroes of the parade are any soldiers still living who participated in the invasion, but by 2014 only a handful could make the trip—it was an honor to see them. I hope for the 75th Anniversary we will see a few survivors but most would be over 93 years old—a tough trip for anyone of that age. An amazing airborne operation in support of the amphibious operation happened during the D Day invasion. It is a story of resilient soldiers, in confusing and stressful situations, who managed to successfully complete their mission. And, we will learn about their exploits and deeds by visiting Ste. Mere Eglise. You should go if you get the chance—their story will bring home the horror of war and their brave story.